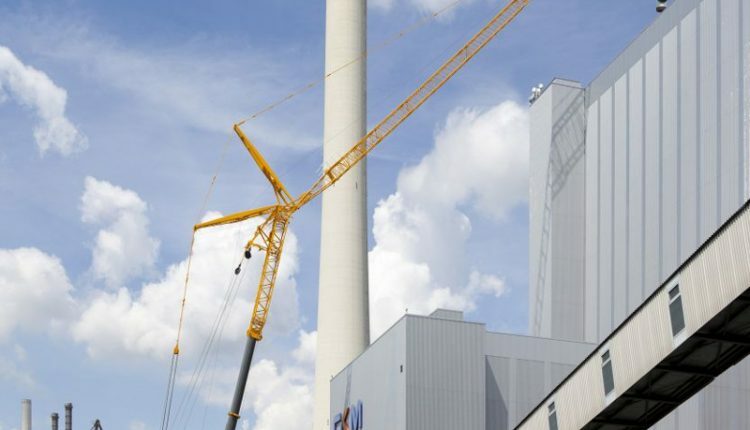 A Liebherr LTM 1750-9.1 has installed a new gas flue at a large power plant in Mannheim. The German manufacturer said that the two building edges, a lifting height of 102m, a large lifting radius and highly constricted working space meant that an LTM 1750-9.1 was ideal for the job. German contractor Hellmich-Kranservice carried out work using the new Liebherr crane owned by Wiesbauer from Bietigheim, Germany. The stainless steel flue has a length of 50m and had to be lifted into the building in sections through an opening in the roof and the flue was then assembled inside. Four elements were required for this: the longest pipe was 14m long and weighed around 6t. Crane driver Karsten Kelm was in charge of the blind lift and managed to control the whole thing perfectly following the instructions provided by the fitters inside the power plant. As a result of the large radius and the height of the building, the LTM 1750-9.1 mobile crane was configured with a full setup, a completely extended 19m telescopic boom extension and a 91m luffing lattice jib. Liebherr said that the short setup times of the LTM 1750-9.1 made it the crane of choice for this job. Features that increase speed of setup include a four-piece telescopic boom being carried on the vehicle at all times. As well as a remote control that assists the crane driver during the setup process. This allows the driver to operate other functions such as bolting the folding beams. The manufacturer said that the fast setup was also enabled by the construction of the fastening points of the components being fitted because the fastening equipment does not have to be changed at any time throughout the setup procedure. It took the Wiesbauer team around a day and a half to set up the crane.